Aluminum wiring is fast becoming one of London’s biggest residential electrical issues and we have spent a great deal of time researching the various options available to homeowners and have the best solutions to make your home’s electrical system safer. Even though it only was used between roughly 1965 and 1980, there are easily over 15,000 homes in the London region with aluminum wiring. This means that 15% of the houses in London are 55 times more likely to have fire hazard conditions present. Replace all the switches and receptacles with new ones that are rated for aluminum wire. These are called CoLar. Rejuvenate all aluminum connections with Copalum Crimp connectors (See Link to Youtube). This is the best and safest method short of rewiring the entire home. Rewire the entire house with new copper wire. This is the most expensive method and about three clients per year have us completely rewire their home. This may not be the solution everyone chooses but one of the homeowners that had us rewire felt that the $12,000 they paid was about well worth the money and would help protect the value of her house and ensure there were no problems with getting insurance. Unlike everyone else in the city, we are prepared to spend hours with you, at no charge, to evaluate the aluminum wiring in your home and provide recommendations on repair and replacement. If you’d like to learn more about your electrical system and investigate the possibility of rewiring your aluminum wiring, contact us for a free, no-obligation home consultation. It’s no surprise insurance companies are increasing premiums or outright denying coverage to people who have houses wired with aluminum and it’s also no surprise that many new home buyers avoid these houses altogether. Since many insurance companies are requiring inspections and repairs before providing insurance to new homeowners we are often asked if we can write clients a letter indicating their aluminum wiring is safe. As you can probably guess from the previous example there are no guarantees with the safety of aluminum wiring as its condition can change rapidly. As a result, we will not provide insurance letters indicating that this wiring is safe. However if you read below you may find a solution that not only meets your insurer’s requirements but also makes your home’s electrical system safer. Is my aluminum wiring safe? Unfortunately, problems with aluminum wiring can sneak-up on you very quickly. Therefore, a house that seems safe today may not necessarily be safe tomorrow. Is there an aluminum wiring band aid fix? 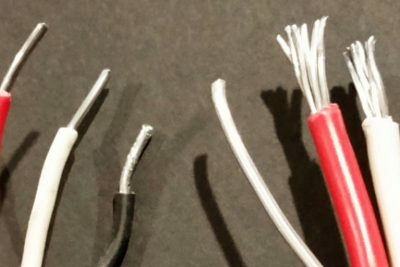 A common, but out-dated and dangerous aluminum wiring repair is the use of pig-tailing connections. Studies have shown how dangerous this repair is and yet many electricians in our area continue to suggest this as a good, cost-effective solution. Pig-tailing is essentially the connecting of new copper wire to the existing aluminum wire. In these cases the copper wire is connected to receptacles and switches with pig-tails connecting the copper wire to the original aluminum wire. The idea here is that you will avoid the disparity between the expansion and contraction of the aluminum wire and the device. Also, the idea is that you’re less likely to experience corrosion at the device given that both the screw on the receptacle or switch and the wire itself are both copper. Unfortunately, this repair has a serious drawback. If the problem with aluminum wiring ultimately lies in the points of connection, then what are we doing here? We are actually DOUBLING the number of connections in the house! As you can see, pig-tailing creates more connections, which opens the door for more troubles. In fact, a very thorough report by the US Consumer Product Safety Commission outlines the problems with pigtailing. Book a free in-home aluminum wiring consultation.